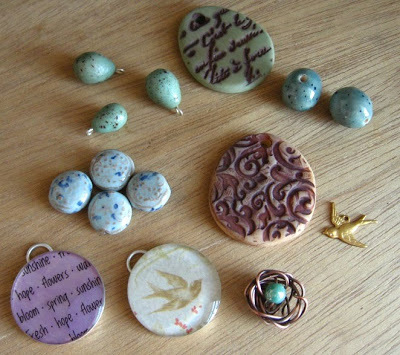 I’m not very good at telling you guys what’s new in my studio, but it happens to be Wednesday and I have seen other jewelry artists participate in this, so I thought it would be fun to post about what’s on my bead table today. 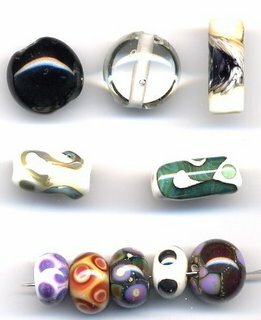 Trying to stockpile pieces for fall, I’m working in series rather than my usual, “make what I feel like making today.” The current series is (begrudgingly) utilizing my stash of Koy Glass lampwork beads. Some of the donuts have rather large holes, and usually this doesn’t bother me because I stick a bead cap over it or a bead in the hole and it looks more polished. 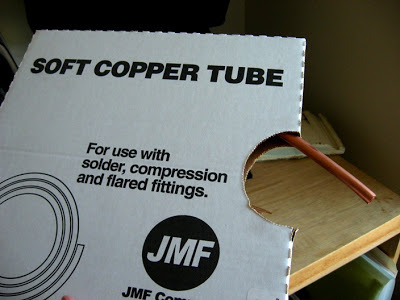 But donuts are worn with the hole showing, so I chose to line them with silver or copper tubing, which I get in the plumbing department at Lowes. This is one of several “bead tables” in my studio, so maybe another Wednesday I will show you the organized chaos of my real bead table. 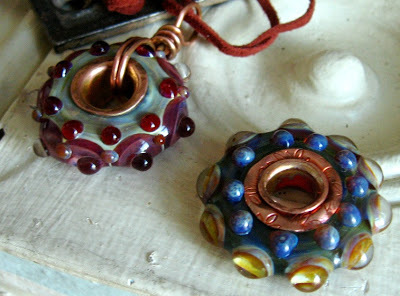 Here are the copper-lined big-hole-beads I did today. And with all the tap-tap-tapping I woke up my studio partner, who was napping across the hall. 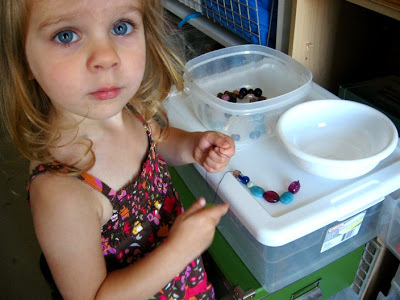 So I put her to work stringing beads. 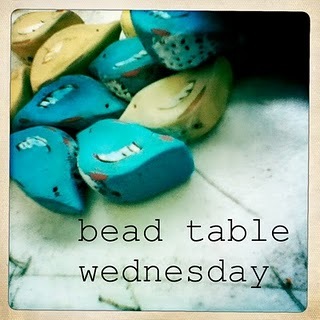 Here is her bead table. 1. On New Year’s Eve we went to the local First Night celebration, and included in the entertainment was a demonstration in the studio of a new glassblower. I was so excited to have a real live glassworker right in town here. A few days later I talked to him on the phone to inquire about renting studio space since it is close to Olivia’s preschool. The local glassblower never called me back about studio space, and that turned out to be exactly what I needed. I still had all my equipment (torch, hoses, kiln, oxycon) from our old house, so I finally decided to have a contractor install a window in the garage with sashes the size of a box fan. 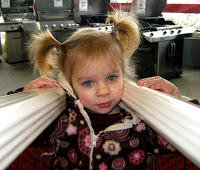 Then I got a great idea for glass rod storage from Kerry Bogert using vinyl downspouts. 3. Two weeks ago I drove through the Finger Lakes region on my way to my in-laws’ house. 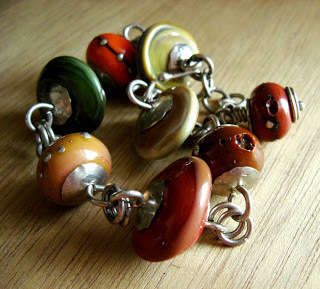 I stopped in at Artizanns in Naples, NY and found this awesome bracelet with wonky, earth-toned beads. Wonky=irregularly shaped, and in this case it was fabulous! Very organic, where lampwork is often bright, cheerful, and perfect. 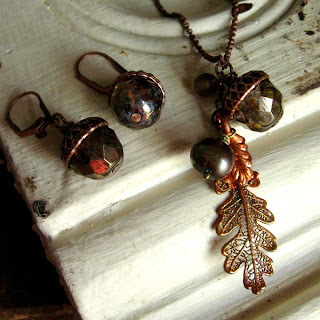 It made me want to make beads — earthy, sloppy ones. So I ordered some new glass colors (first time trying Creation is Messy) and fresh bead release. I still need to test out the hose connections and pressure, then do an incense test on the ventilation. 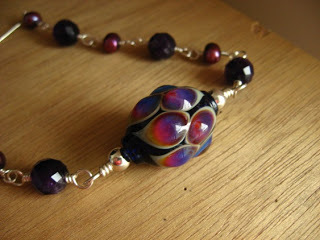 So… I’m closer to making some lampwork than I was six months ago, but I’m still not there yet. 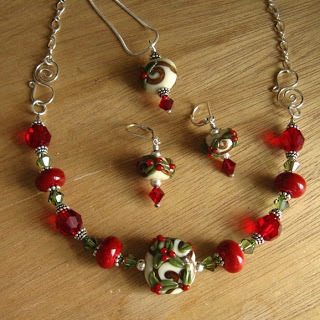 Not to mention that school is out so Olivia is home every morning and I am trying to work ahead making jewelry to sell in the fall when our baby is due. 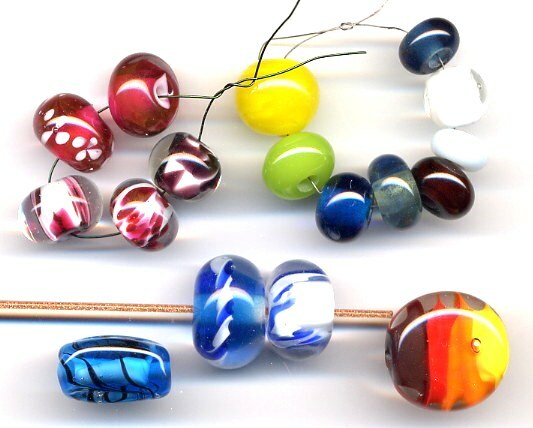 Glass rods don’t go bad, just the bead release. So if I don’t get to do everything on my studio to-do list this year, so be it. I’m in the season of Having Small Children and that’s what’s important right now. I’m down with OPB (other people’s beads). 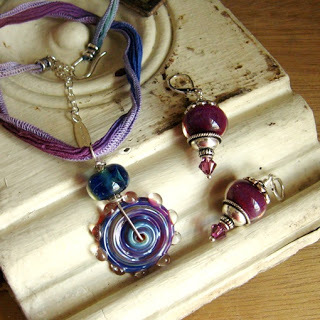 This week I took a 2-day Intermediate Lampwork class at Starleen’s Studio. 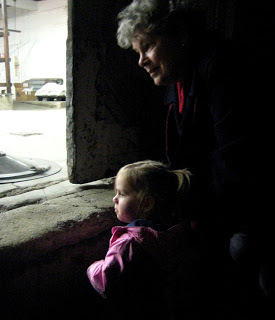 She is an excellent instructor and really bends over backward for her students. These are beads from Day 1 here. 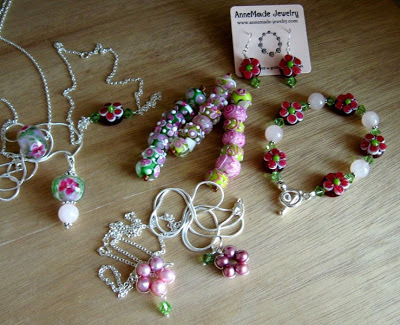 The pink beads are a “striking” (read finicky) color called Rubino Oro, one of the best pinks out there. 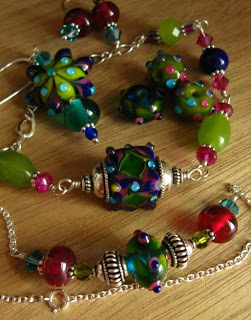 The one with flowers was done by Starleen, but it looked good with the encased frit beads. To their right is a study of how different families of glass act when molten, so they’re just plain rounds & spacers. Stringer/twisty application is in the center (staged on a goldstone stringer to get them to sit right), a Sahara bead (looks like a round candy corn), and an aqua feathered tab (sounds totally 80’s) . 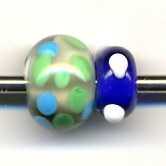 Day 2’s beads had to stay in the kiln to anneal, so I’ll get those in the mail later. 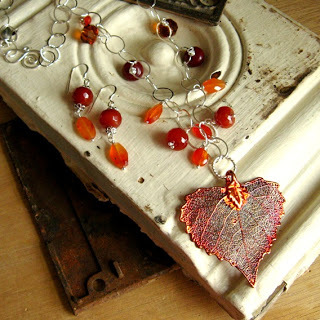 On Saturday my friend Mary and I are heading to NYC to take Sharilyn Miller‘s Twining Vines class. She lives in California and doesn’t come out this way much, and she’s one of the country’s top wire workers. 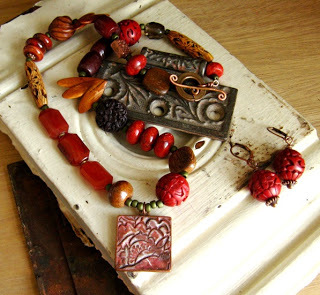 Her book Bead on a Wire is one of my favorites. 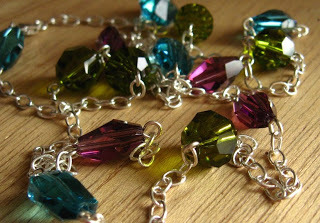 New classes are starting at Sparkles, too! I just posted my December schedule. 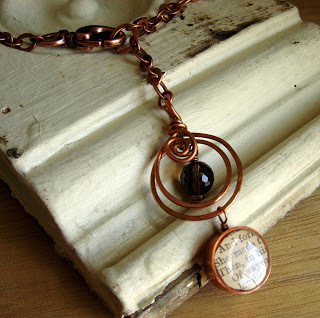 As much as I love surfing the web to see what’s going on in the world, what I really need to be doing these days is making jewelry for the upcoming shopping season. Forgive me if I don’t post as often, the highlight of your day though it may be. I’ll try to slap stuff up on the Sneak Peek page as I make it, just to throw you guys a bone (you who are here for new stuff). On Saturday Steve and I visited the Reading Terminal Market in Philly where one can find produce, baked goods, ice cream, and ethnic food from falafel to wontons. We had southern food at Delilah’s. Yesterday we braved the rain for Taste of Wilmington to sample food from local restaurants and caterers. Highlights were one of the most delicious crabcakes ever (backfin meat with a minimal amount of filler), an oh-so-tender prime rib sandwich, and chocolate fondue from the Melting Pot. I saved that for the ride home since it was hard to eat while holding an umbrella. They only give you 4 things to dunk in the cup of chocolate, so instead of just drinking the rest I held out and dunked my Swedish ginger cookies in it at home. Riley is going stir-crazy in all this rain! She needs a jog big-time, but alas I am made of sugar and do not run in the rain. My garden, on the other hand, is doing really well. I think we have a tomato plant volunteer in between shrubs in the front of our yard. The real vegetable garden is at my neighbor’s house in the back. He bought the planters and we bought the plants & potting soil, and we already have an abundance of basil and cilantro. We’re getting closer to having our own cucumbers, zucchini, yellow squash, peppers, and tomatoes. Vegetable plants? $24. Soil? $20. Pale, bland, storebought tomatoes October through June? $10. Picking your own vine-ripened beefsteaks? Priceless.